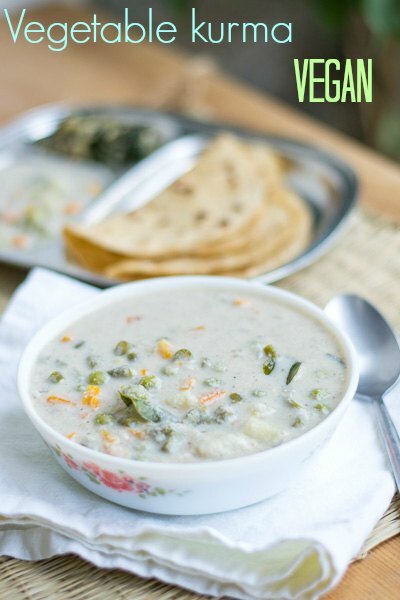 Vellai Kurma – Restaurant Style South Indian White Vegetable Korma. South Indian Tamilnadu Restaurant style white vegetable kurma called as vellai kuruma or parotta korma. With video and step by step pictures. Finger licking good! I learnt this Vellai Kurma recipe after marriage from my mother in law. She is an awesome cook. My father in law is a foodie. This is his favorite curry to have with chapati. In my early years of marriage, whenever my in-laws used to visit us, I would just help around in the kitchen. The true cooking was done by my MIL. She used to make this as a side dish for chapati. Its a very easy recipe and comes out very well every single time. Usually in Indian curries, the spices are dry roasted and then ground. But for this vegetable kurma, the spices are ground raw. 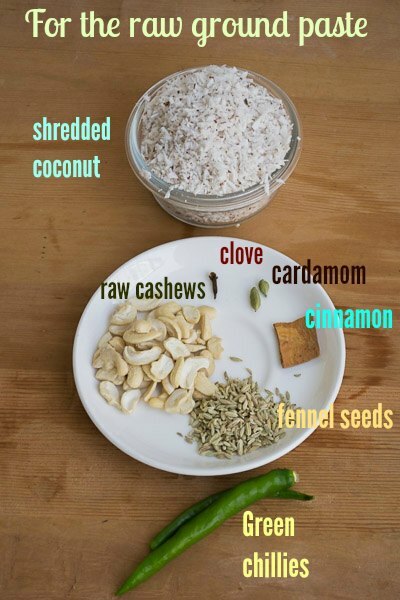 Grind all the ingredients listed below with about 1-2 cups of water to a smooth paste. Boil about 4 cups of mixed vegetables until al-dente and keep aside. 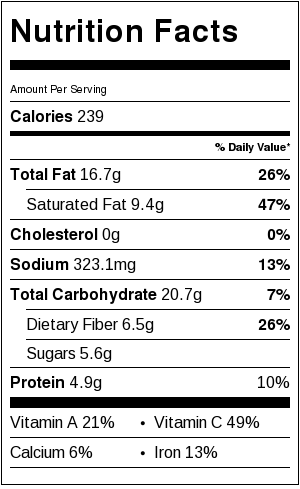 Do not use a lot of vegetables. 4-5 different vegetables should do fine. Adding potato gives the gravy some body. So don’t miss the potato. Here is how I boil the veggies. I cook the veggies with quarter cup of water in a pressure cooker (3 litres) for exactly 2 whistles. Immediately release pressure from the cooker by lifting the whistle weight carefully. Releasing the pressure manually is important to get the veggies with the right texture for kurma without the veggies turning mushy. 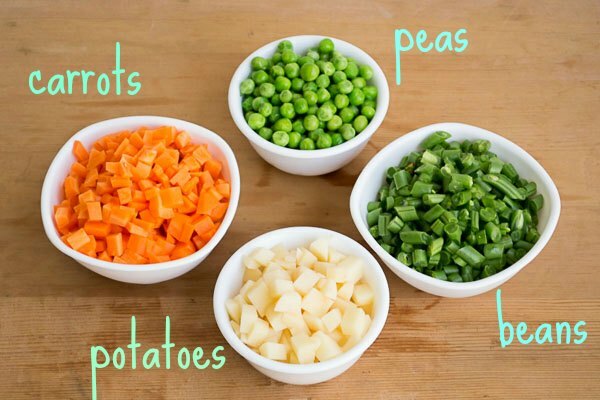 Refer to this post to know how to cook veggies in a pressure cooker. Heat the oil in a saute pan. Add in a teaspoon each of cumin seeds, fennel seeds and 2 sprigs of curry leaves. Let it splutter. Add in the chopped onions and salt. Saute till slightly brown. Add in the ground masala paste and let it simmer in low flame for about 5 minutes. Once the raw smell goes, after 5 minutes add the boiled vegetables. Take a small cup and add a tablespoon of cornstarch or maida (All purpose flour). Add 1/2 cup water to it and make a slurry. Add the slurry to the gravy. The slurry helps in thickening the gravy. Do not add the corn starch or maida directly as it may lump up. Simmer for couple of minutes more. Serve hot with roti or chapati. 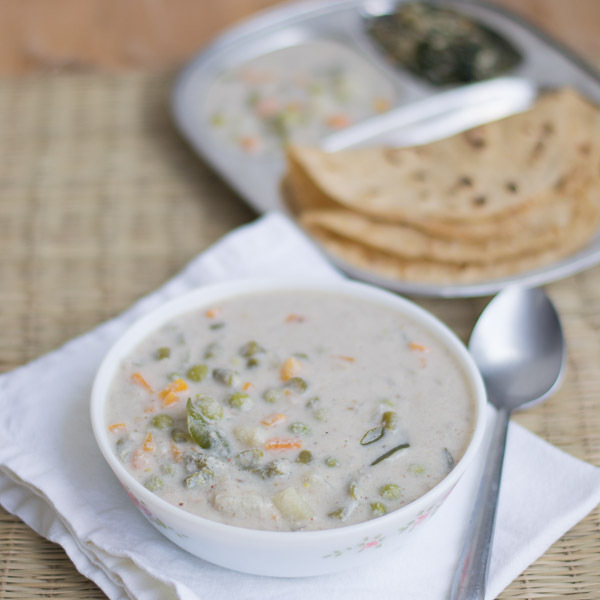 South Indian Tamilnadu Restaurant style white vegetable kurma called as vellai kuruma or parotta korma. Finger licking good! Raw ground paste: Grind all the ingredients with about 1-2 cups of water to a smooth paste. Boil about 4 cups of mixed vegetables until al-dente and keep aside. Once the raw smell goes, after 5 minutes add the boiled vegetables. Take a small cup and add a tablespoon of cornstarch or maida (All purpose flour). Add ½ cup water to it and make a slurry. Add the slurry to the gravy. The slurry helps in thickening the gravy. Do not add the corn starch or maida directly as it may lump up. Simmer for couple of minutes more. Total hit, I have made so many times! Mam, may I use rice flour instead of maida…..
thanks for thhe recipe.. can chicken be used instead of the vegies? If cumin seeds are reduced to 1/2 tsp (or omitted) and curry leaves are omitted, this tastes very similar to the Vellai Kurma served in Hotel Saravana Bhavan for chapati in mornings. I feel this tastes better than that. Everyone at home loved it. Thank you so much! Sure. You can adapt the recipe to your liking. Happy Cooking. looks really simpe n easy. why Ginger n garlic paste hasnt been used for this recipe? specific reason?? Why should all the recipes have ginger garlic paste????? Hi! I made this ydy and it tasted superb….Thanks for this awesome recipe. Just tried d recipe a couple of hours before,tasted SPLENDID . The whole family loved it.. I added some cloves of garlic too..
We all had it with Idiyappam.. Thank you so much Mikku! Thank you Karthikadeepaa. Glad you liked the recipe! Will it be suitable for Poori? We have always had this with chapati or apam , idiyappam and the likes. Never had with Pooris. I tried dis korma . It was wonderful. Suguna, your recipes are terrific. I tried the Ambur mutton biryani and the chettinad poondu kuzhambhu- both had raving reviews! People couldn’t stop talking about how authentic they were. Thanks so much! I haven’t ventured much into south Indian cooking after a failed attempt a few years back. I’m more of a Baker. I like precise instructions and measurements and your recipes have both, in plenty. I’m eternally grateful 🙂 keep writing your wonderful recipes and stories. Lots of love from Chennai, India. Thank you so much Deepika. really glad that you like the recipes. There is no garlic in this recipe. This is a mild kurma and garlic may make it strong. This is a family recipe. I just follow what elders did! Y in yr blog, searching a dish s not a easy one….? Try to alter it…. Will this go well with parotta? My hubby is from chennai who loves this white kurma which goes with parotta. I have no idea about it till I found ur site.could u plz let me know asap so I could try it? Thanks in advance doll. Yes it does go well with parotta Jeni! Thanks i will definitely try. Thanks Suguna, I like all your vegetarian recipes. I follow some of them. I dont see any Garlic and ginger. I thought korma had ginger and garlic. Just try it. You will be pleasantly surprised. Garlic and ginger makes this kurma very pungent. Its a very mild kurma. Really glad that the vellai kurma came out well. Happy Cooking! Will this gravy go with idiyappam? Yes. It does go well with idiyappam. Do u have any veg side dishes, posted , that goes well with naan ? Will this kurma be good as a side for naan ? Planning to make for a get together.. I serve it for Chapati and parotta. Naan – I think it wont pair well. Its a coconut based gravy. White kuruma became a huge hit at my place! 🙂 Thank you so much for the recipe! Thats so nice to hear Lavanya. I like it a lot too! I tried the recipe of “Chettinad Vellai Kurma ‘ it came out very well. Thanks for the same. You are most welcome Vijay! Happy Cooking! Thank you so much Subhany. I am really glad that this kurma brought back memories. Tried it and liked it very much. White Veg kurma is my top favorite. Made it for the first time today looking at your recipe. So simple and authentic (made it with idiyappam). Whole family including my 19 month old relished it. Thank you. Will try more of your recipes. Next will attempt your 1 min mug chocolate cake.. and respond. Thanks Suguna.. Made this Kurma for Chappatti.. Tasted so good. Everyone liked it. Spice levels are also perfect for children. Thank you so much Sunitha. Very happy to hear the children liked it. Thanks. It tasted awesome. In fact both my kids and my husband said this kurma was the best combo . Will it taste gud with idiyappam?